This water bottle holder is so convenient for anyone who wants to walk and not have to carry their water bottle. 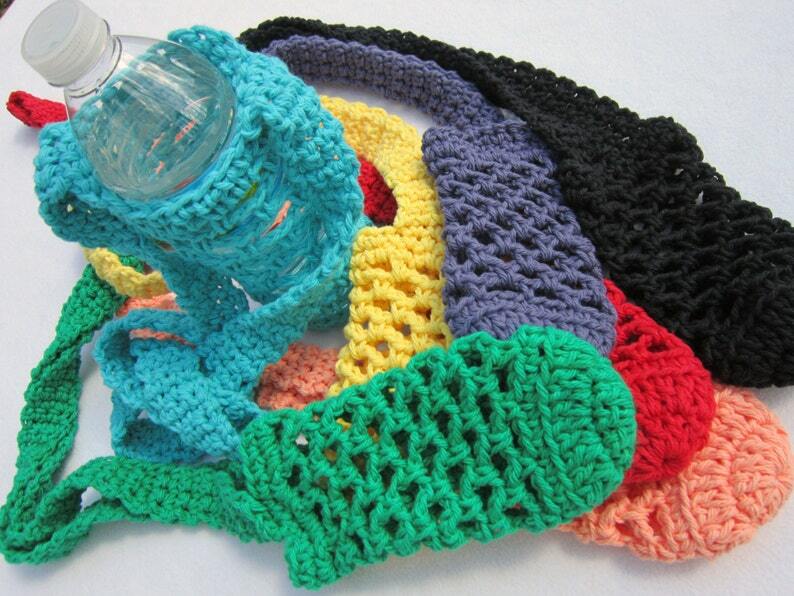 I've crocheted each of these holders from cotton yarn. They are made to fit a size 16.9 to 20 ounce bottle They have long straps so they can be worn across your body, or can be worn on your shoulder. They are great for taking on vacation or for exercise. Or even to work, so that you'll always know which water bottle is yours. It can be thrown in the washer and washed and then dried in the dryer. Please note that you can save money by ordering 2 or 3. Please let me know the colors you prefer in a note to seller at time of purchase. Please let me know if you would prefer a color that is not shown and I will do my best to make one for you. There are also color choices that are not pictured. Please take a peek in my shop. You never know what you'll find there. Want to know when I'm running a special or giving away coupon codes? Sign up here. Received, love it. Thank you!